Last December, Zero1.tv, launched their VooMote Zapper, a universal remote control dongle that attaches to your iDevice via the standard 30-pin dock connector port. It works along with a FREE companion app to allow users to transform nearly any iDevice into a full-featured and customizable universal remote control. 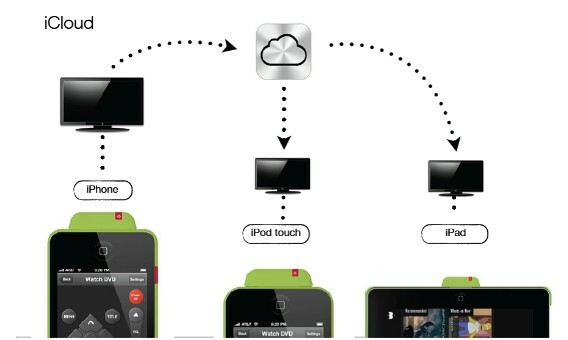 In a household with multiple individuals, each with their own iPhone or iPod Touch, sharing the VooMote across devices meant that each person had to install the app and configure the component codes themselves and if any part of the entertainment system was swapped out or added, everyone would have to change their copy of the app. With the latest update to the app, Zero1.tv has added support for iCloud®. This means that now there is no need to individually setup each an every iDevice in your household that might use the VooMote. The apps settings are now saved in the cloud, so as long as each device uses the same iCloud account, they will automatically get any configuration changes the next time they load up the app, making the $69.99 accessory much more shareable. The VooMote Zapper is available in a number of colors including: Red, Pink, Blue, Green, White and Black and can be purchased directly from zero1.tv or at apple.com. And again, the companion app is FREE. We’re hoping to get our hands on one of these for a full review soon.